At Rooftoppers, we are roof coating experts. We have a specialized team of roofing technicians standing by who can properly assess, address and complete all your roofing needs in a flash. Don’t trust your home to just anyone. Make sure you are only dealing with a local, reputable roofing contractor who will be there for you now and for years to come. This is important because what good is a warranty if the company who gave you that warranty is no longer in business or nowhere to be found when you need them? A roof coating is a single surface liquid roofing membrane that is applied as a roof’s surface. A roof coating has elastic properties that enable it to expand and contract without being damaged. Most roof coatings, once dry, vary in thickness. They can actually be part of the top layer of a composite roof membrane and the underlying system. Which means the coating is the uppermost layer of protection; therefore, it can withstand the brutal impact of extreme sunlight from both infrared and UV rays, as well as rain, hail and other flying debris. Roof coatings are seamless if they’ve been installed correctly and can help fix many types of leaks. However, there are some exceptions. Additionally, reflective coatings can help extend the life of just about any roof substrate. Another great benefit that comes from having a roof coating installed and that goes beyond extending the life of your roof is the fact that you could potentially receive some tax advantages (and maybe even some rebates) since roof coatings are usually considered a maintenance item. However, we are not tax professionals; therefore, you will need to talk with your accountant before using your roof coating as a tax deduction. Roof coatings are most commonly used on commercial, industrial and institutional buildings. However, they are also sometimes used on low slope residential homes as well due to their many benefits and lifetime cost-effectiveness, as well as their low maintenance performance. Roof coatings are another popular option when it comes to roofing materials for commercial and other large buildings. They are designed to protect and extend the useful life of a roof. And they come in several different classes. Solvent-Based Silicone Coatings. These are coatings that use organic solvents and can be applied throughout a variety of temperatures. However, they are usually flammable and sometimes toxic. This type of coating can be sprayed or rolled on using a medium-nap roller. Additionally, this type of coating has several major advantages over the other types of roof coatings. A solvent-based silicone coating can resist ponding water for long periods of time and it is able to adhere to most substrates without having to also apply a primer. 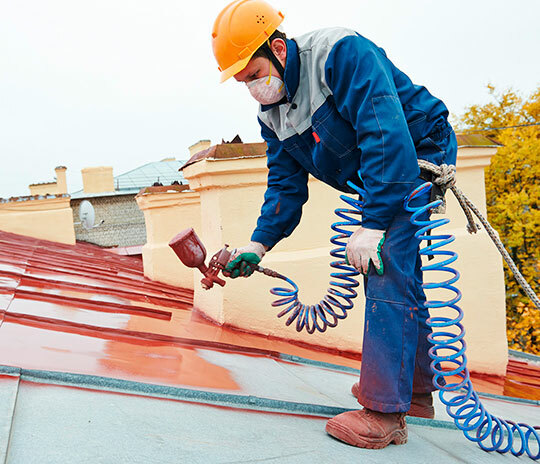 Therefore, this type of roof coating offers you the best option because it’s both cost-effective and is of very high quality. Solvent-Based Asphalt Coatings. These are sometimes referred to as cutback coatings because the asphalt is “cut-back” with solvent which causes the coating to liquefy so it can be more easily applied. A solvent-based asphalt coating is usually available in either a black or aluminum finish reflective coating. They can be applied using a heavy-nap roller; however, care must be taken during the application process because they usually contain asbestos. Water-Based Coatings. These are, as the name suggests, water-based, which means they aren’t flammable or toxic. A water-based coating can be easily cleaned and very rarely allows anything to bleed through. And, they are less expensive than solvent-based coatings. 100 Percent Solids Coatings. These are a less common roof coating, but they consist of 100 percent solids. They don’t contain any solvents and don’t have the same limitations as water-based coatings do. This coating requires special application equipment and is very sensitive to changes in the application temperature, which could affect its ability to form a durable surface. Acrylic Coatings. These coatings are known to be extremely durable and can be made to be very elastic and flexible throughout a variety of temperatures. And, they aren’t all that expensive. This type of roof coating is available in water-based or solvent-based form.